ABOVE: Kempinski Hotel Vier Jahrezeiten, Munich. Heads of state, celebrities, and expense-account aristocrats have flocked to the Four Seasons since 1858. 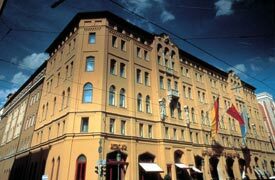 The hotel is on the Maximilianstrasse, in the heart of the city's shopping district. The 340 rooms at this downtown luxury hotel come in three styles: Laura Ashley, Country House, or Palais. TVs feature Playstation and Internet games, but that doesn't mean the Bayerischer Hof doesn't respect tradition: It has been family-owned and operated for more than a century.